A Los Angeles entrepreneur is capitalizing on divorcing women's desire to rid themselves of their cumbersome marital possessions by hosting a series of divorce sales, where rich ladies sell their fancy things for a low, low price. Also, girl power and stuff. "I just knew it would work. 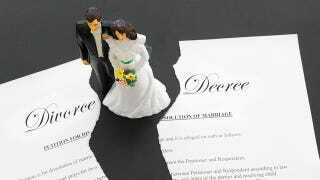 Divorce is pretty common these days and people are looking to offload their stuff," Alexander told the Observer. She sees huge potential for the Divorcee Sale across America and the rest of the world. "Divorce doesn't just happen in southern California," she said. "It will be my way of turning a negative into a positive." It seems a win-win situation. The women get a windfall just when they need it; customers get knock-down prices; and Alexander takes her cut. A percentage of the proceeds goes to various charities. And where would the world be without various charities? Divorce Sale operates solely in LA for now, but is planning a big New York divorce sale soon. Alexander expects it to be crazy bananas full of people and awesome stuff. Not everything's gone perfectly for her, though. So far Alexander's only disappointment is failing to attract any celebrities to the cause. "I thought the celebrities would come but they have not shown up yet," she said. Perhaps image-aware stars are still a little wary of being associated with divorce, despite its prevalence in Hollywood, or more likely they are used to handling such things themselves. "I thought the celebrities would come but they have not shown up yet" perfectly describes how I felt the first time I tried to set up a lemonade stand at the end of my driveway and the only person who bought from me was my dad who felt bad for me that no cars drove down our dirt road. I think I got like three dollars. Anyway, divorce sale parties- for the diamond necklace-throwing spurned woman who lives inside all of us.